We have received a few comments regarding voting patterns at Eurovision. Is this a good tool to map likes and dislikes between Europen countries? Not, because of the voting system (see here), the non-representative selection and the lack of clear patterns in the majority of the countries. 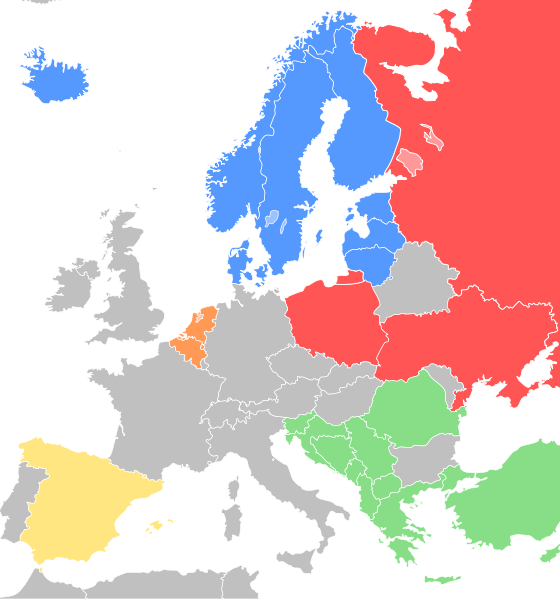 (Fellow blogger and Eurovision "expert" Anjci is giving some interesting explanations on nationa l voting habits - see here) However, what we can do is a limited conclusion of some regional groups of countries that tend to vote for each other. Even though the voting rules have been changed since, if you look at this year's voting results (see here), you can find the above patterns repeating themselves. Slovenian TV has produced an interesting map, that you can reach here (Thanks for @DraganBrBr for the link - for those few who don't speak Slovenian look at the video around the middle of the page). Through @anamariadutceac we found that Spiegel online has also published an interesting take on the cultural significance of Eurovision - see here. The first great thing about Eurovision is that it represents a rare point of agreement in the longstanding language argument between Kováts and Kovács (1, 2, 3), or even to some extent a role reversal. While Kováts keeps arguing for multilingualism (aka affirmative action for French) in Brussels, and Kovács embraces monolingualism (code for not having been able to properly learn French), we both agree that contest songs should be in (one of) the national language(s) of the contestant’s country. In fact, Kovács feels much stronger about it, and would have preferred a Gaelic entry from Ireland. We have tweeted about it before and were criticised by @spignal of the Financial Times for meddling with things that are not related to the EU. Well, the Eurovision is more closely related to the EU than many would think. It brings understanding between coutnries through sharing their culture. Started in 1956, as a project of Western European unity, it has soon become a weapon in the cold war and to the repressed people of the Communist bloc it has brought a taste of the free world through the airwaves (even if Communist authorities did their best to disturb those waves). After the fall of the iron curtain, the coutnries of Central Europe not only started negotiating their acession to NATO and the EU, but they also joined the Eurovision Song Contest as a symbol of their European identity. Here is a nice documentary on the importance of Eurovision in the cold war (in German). According to the original rules, songs had to be sung in the national language (an exception was made between 1973 to 1977, which resulted in the success of ABBA with Waterloo and of Teach-In with Ding-A-Dong ). This requirement has been lifted in 1999, which now created a situation where the majority of the songs are in some form of simplified English. We wonder, how can performers share their country's culture by singing in simplistic English? 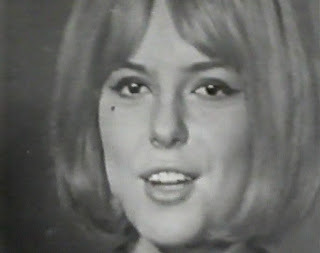 We are probably irreparably old fashioned, but Gainsbourg’s song performed by France Gall in French (which won forLuxembourg in ’65!!) remains the best thing that ever came out of Eurovision for us (see here). Whether you like it or not, it represents a long-lasting contribution to European culture. Even though it has been translated into many languages could you imagine Gainsbourg-Gall in English? Well, this is exactly the point. Originality Second, we were both baffled by the degree to which songs have, well, “showed similarity” to earlier works. At the most extreme end of the spectrum, the first 15 or so seconds of the Swedish song is sampled 100% from Boney M’s “Night flight to Venus” (at 0:34). But in many other cases, even our musically illiterate ears picked up very strong similarities with other hit songs. Hat-tip to Serbia - Third, the favourites. It was of course with great sadness that we saw the Hungarian entry linger in the lower ranks all through the voting, even though many in Hungary and some even outside it predicted it to be among the top songs. (A good example of distorted Hungarian domestic debate is that some commentators blame the Fidesz Gorvernment for the lack of success in this year's Eurovision) It was no consolation either that the first 13 places went to English language songs (excusable from our perspective only for Ireland and the UK) with Serbia coming in at place 14 with a Serbian song – goes to show that going all English is probably a rational strategy for contestants. Finally, the voting. A subject of considerable debate and even some serious looking research, this is one of the highlights of the contest. We wouldn’t like to comment on possible voting patterns, suffice it to say that people’s preferences, as usual, are more difficult to predict (read: impossible) than a few rules of thumb would suggest. In the end, the winner did not disappoint, even though it wasn’t the favourite of either of us, and thus it’s time to congratulate Azerbaijan and wish Baku the best for hosting next year’s contest – they will have large shoes to fill. I tend to agree with you in the general, although some aspects of Eurovision you find baffling are quite simple, really. The great Terry Wogan observed sometime in 2005, in the run-up to the yearly songfest, that non-English pop songs are, as he put it, quite silly, really. English is the language in the music industry – unless you are Gainsborough and set your sights on the French charts – so there’s nothing surprising that the restriction on the language use was eventually lifted. It would be quite pointless to carbon copy Take That or Katy Perry and then release a song that’s only understood by a fraction of your intended audience. I’m sure “Waterloo” would be charming in Swedish, too, but it would have probably spared the world from the phenomenon into which ABBA eventually developed. Second, I don’t actually find it strange that only few of the songs exhibit any sign of national character. When Nox run in 2005 (?) with their folksy tunes ("Ragyogas"), Wogan immediately dubbed them “gypsies’, which didn’t particularly went down well, to say the least, with certain Hungarian viewers. But at least it neatly highlighted the limitations of originality and acceptance. Don’t tell me you didn’t at least smile at those chaps with their pointy hats from Moldavia. @spignal says: now, now, this wasn't so much criticism as a gentle ribbing about the ubiquity of the Hungarian presidency press team. It reinforces my theory that there are in fact 17 Kovats/Kovacs/Gergely/Martons on hand to comment on all aspects of EU policy from fisheries to singing contests to bail-outs. Even on Saturdays. I can assure you the Financial Times has no views on languages at Eurovision! I know what we suggest is utopistic, but it does not mean we should give up without trying to get closer to the ideal. There is good non-English language pop-rock-etc music in most European countries, from Die Toten Hosen to Tankcsapda. It is only when they enter the international stage that they pick up this computer generated silly English. Good songs can be performed in languages different from English. Look at Belgium, which twice entered with songs in an artificial language (2003 with Sanomi and 2008 with O Julissi!! Creating rules against the tide usually don't work - so I am thinking rather of soft rules, encouraging national selection and voting patterns that appreciate use of the national language in some way, even if mixed with English. Dare I suggest - seriously - that all the competitors be asked to perform in Esperanto, a language of no particular nation? I agree with the comment about Esperanto. Can I ask anyone who supports the cultural identities of individual nations in the Eurovision Song Contest to vote here! I also tend to agree. Besides, I find this blog hilarious and I try to stay updated with your daily adventures around the world. Keep up lads.